White Album’s anime adaptation was met with fairly mixed reviews, and while I can understand why it met with a lot of criticism I still enjoyed the series for what it had to offer. For those who are unfamiliar, White Album is a visual novel whose main character is dating a new idol that is beginning to rise up the ranks, and throughout the course of the series he finds himself in situations involving infidelity and complicated relationships. The anime upped the sleaze factor of the main character and some viewers were less than impressed with his decision to hook up with just about every female lead, plus the so-so animation and production values didn’t make the series as visually impressive as other some of the other romance/dramas out there. But even so, I enjoyed the time I spent on that rollercoaster ride of a show and was ready to see what the adaptation of the sequel had to offer. Rather than continuing the same storyline, White Album 2 has entirely new characters and focuses on a high school light music club. There’s still a complicated love triangle, but the cast is much more likeable and not as detached as those from the original so viewers are likely to get much more mileage out of this one. Like so many romance/drama visual novel adaptations, White Album 2 starts off on a much happier and lighthearted note, though it does showcase a quick bit of drama at the beginning that gives the viewer a hint of what’s to come. The main character is Haruki Kitahara, a third year student at Hōjō High who is also an aspiring guitar player. He’s part of the school’s light music club, but it is on the verge of falling apart as they have lost almost all of their members. Haruki’s your fairly average high school protagonist but he has just a bit more courage than you’d expect, and decides to target Setsuna Ogiso as their potential singer. Setsuna is a fairly popular student who has won the title of Miss Hōjō two years in a row (which if something of an idol/beauty competition that the student body holds every year). Although she seems somewhat unapproachable at first, Haruki soon discovers that she’s actually a bit shy and was talked into entering the Hōjō High by friends. However, she is a fan of karaoke and is eventually convinced to become the light music club’s singer. At this point the band still doesn’t have enough members, but they do have club president Takeya Iizuka on guitar. During the period that the light music club was in danger of disbanding, Haruki was still faithfully practicing his guitar in the club room on a regular basis. One song that he would play on a regular basis is “White Album” by Yuki Morikawa, which is one of the main themes from the original series/game. Whenever he plays this song an unknown music student in one of the nearby practice rooms would join in on piano, and silently coach him as he learned how to play it. Eventually Haruki decides that he wants this person to join the light music club, and after climbing out the window and scaling the nearby ledge to get into the room he discovers that his musical companion is Kazusa Touma. The two are not complete strangers, as Kazusa sits next to Haruki in class but spends much of her time sleeping and doesn’t come that often. It turns out that she’s the daughter of a famous pianist and is quite talented herself, which has given her special privileges within the school. Though she has a bit of an icy exterior and can be quite cruel towards Haruki, he eventually convinces her to join the light music club. Takeya agrees to do the backing track and leave the spotlight to Haruki, Setsuna, and Kazusa, and the three become friends as they prepare for a performance at the school festival. As you probably already guessed by now, as the three spend time together and practice as a band a bit of a love triangle begins to form. There’s a blossoming friendship between Setsuna and Kazusa, which is something of a first for Kazusa. Due to her upbringing and absent mom she lives alone and is one of those people that tends to not open up to people and comes off as a bit abrasive. Both show an interest in Haruki from a romantic perspective, though they do it in very different ways. Setsuna makes the first move and ends up dating him, and things start to only get more complicated from there. What White Album 2 does well is its ability to make you care about all three characters. There are no real winners here, as each person makes mistakes in their attempt to navigate between friendship and romance and it’s truly captivating to watch. Setsuna seems like the shy one of the group who deals with a bit of stage fright, but she’s also terrified of losing friends and tries her best to make a friendship with Kasuza and an intimate relationship with Haruki work. Kazusa’s arguably the most interesting, as there’s a lot more complexity to her character than I expected it (and it’s an element I don’t want to spoil as it would give away a few too many details of the storyline). Haruki ends up caught in the middle, but unlike the protagonist of the first White Album you can’t really fault him for all of his choices. What follows is a truly engrossing drama that tugged at all my heart strings and kept me wanting to keep going. As I said in the previous paragraph, I don’t want to go into too much additional detail about the relationships and nuances that follow in each episode as that’s part of what makes the series so enticing to watch. But the biggest difference between White Album 2 and its predecessor is that right from the beginning the characters are more likeable. Haruki’s a likeable lead who may fit that “every man” high school student stereotype, but he’s not quite as spineless as some of the other VN leads out there. Setsuna and Kasuza are likeable in their own way, though I continue to find the latter to be the character I ultimately ended up rooting for in this messy love triangle. Even at its dreariest and most depressing I couldn’t tear myself away, and compared to some of the others in this genre the self-imposed hardships and heartbreak the characters go through feels more realistic. It is worth noting that the 13 episodes only encompass what is the introductory chapter of the game, and there’s an entire second half that takes place three years later. Seeing as the game hasn’t been picked up for an official release (and a fan translation is progressing fairly slowly), I really hope the rest ends up being animated in a future season. Seven Arcs produced the first White Album, which had an almost soap opera feel to its animation. Things were more subdued compared to the usual anime look, and there was less that was eye catching per scene. 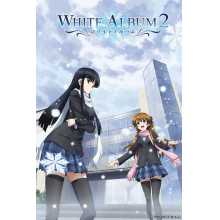 White Album 2 has been handed over to a completely different studio, with Satelight handling the production. The differences are immediately apparent, as everything about this sequel is more eye catching. There’s more details to the backgrounds, and the characters have a much softer feel that fits with the high school aesthetic. It also makes the shift over to drama at around the halfway point have that much more of an impact, as the characters showcase a good deal of emotion through how they were animated and are able to portray some subtle nuances. I didn’t notice any major dips in animation and there was a consistent feel throughout, so it appears that Satelight was the right choice to lead this production. As far as audio is concerned, there are some songs that were featured in the first anime/game that appear during the school performances which I thought was a nice touch that tied the two together (and they fit thematically considering the subject matter). The opening and ending were both fairly unremarkable, as they seemed to me like fairly generic themes for an anime in this genre and the songs that were actually featured within the series itself seemed to stand out more. Voice acting is where White Album 2 really hits its stride, as all three of the main characters are well cast. They gel with each other perfectly and are able to sell the emotional peaks of the drama, which further drew me in to what I was watching. Although I did like White Album for what it did, this sequel was a much more compelling watch. Admittedly there are quite a few elements of the plot that are easy to predict, and the story does give away some of the nuances right in the first episode. But with a more likeable cast and drama that feels a bit more realistic and complex, White Album 2 continued to capture my attention from one episode to the next and fully engrossed me in the lives of its characters. If you’ve watched a good deal of romance/visual novel adaptations you likely know what you’re getting yourself into, but if not be prepared for some amusing scenes and some that might just get the tear ducts flowing. I suspect this one will draw me back for another viewing at some point, and hopefully we’ll get to see just how much further the love triangle goes if another season gets greenlit.